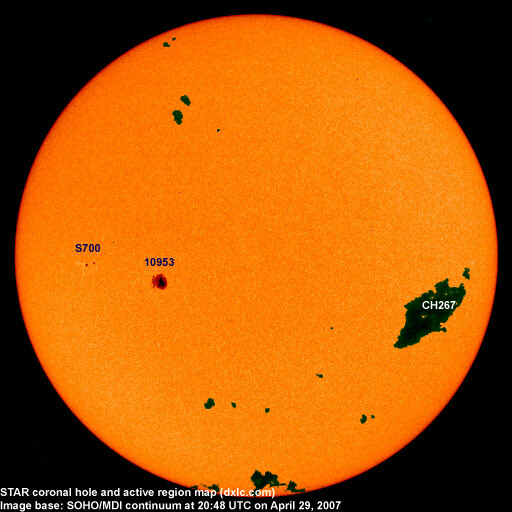 Last major update issued on May 1, 2007 at 05:25 UTC. The geomagnetic field was quiet to minor storm on April 30. Solar wind speed ranged between 511 and 680 km/s (average speed was 589 km/s, decreasing 30 km/s from the previous day) under the influence of a high speed stream from CH267. Solar flux measured at 20h UTC on 2.8 GHz was 87.0. The planetary A index was 20 (STAR Ap - based on the mean of three hour interval ap indices: 19.8). Three hour interval K indices: 55423221 (planetary), 55531112 (Boulder). Region 10953 redeveloped some small spots outside of the main penumbral area. 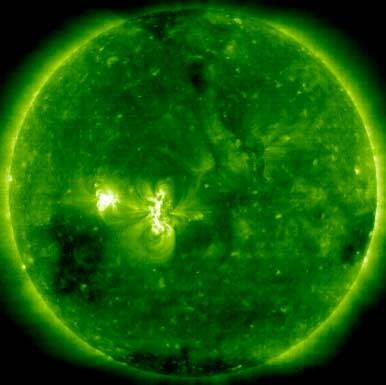 C flares are possible and there is a minor chance of a small M class flare. 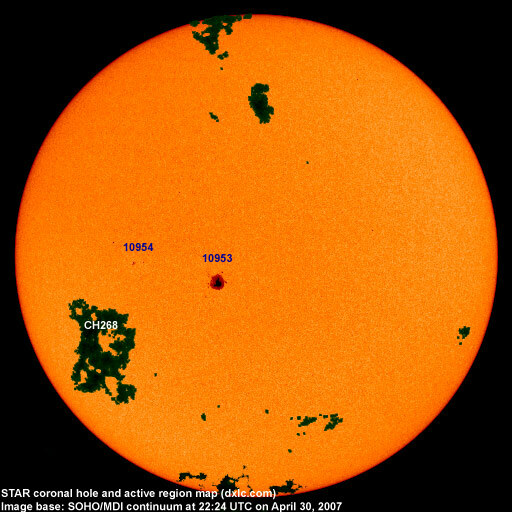 New region 10954 emerged in the southeast quadrant on April 28 and was numbered two days later by NOAA/SEC. The region decayed on April 30. April 28-30: No obvious fully or partially Earth directed CMEs were observed in LASCO imagery. Processed SOHO/EIT 195 image at 00:00 UTC on May 1. The darkest areas on the solar disk are likely coronal holes. The geomagnetic field is expected to be mostly quiet on May 1-5. A high speed stream from CH268 could reach Earth on May 6 and cause some unsettled and active intervals that day and on May 7-8.